Refinishing, custom inlays or guitar restoration? Check out some of our guitar customising options! 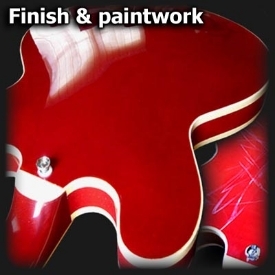 Instrument re-finishing & inlay customisation are specialist skills in their own right. At Guitarlodge we strive to provide for every possible requirement when it comes to professional fretted instrument repair. From our huge choice of colours & finishing options, to the vast creative possibilities available using custom inlays, there are no limits when it comes to personalising your instrument. Our guitar restoration service often includes finishing work along with several other procedures from this website, & many instruments have been carefully restored to their original priceless state! If you are considering any customisation work on a musical instrument its well worth asking us first. When it comes to paintwork we will advise & discuss all the details including preparation work involved, stains & lacquers used, an estimated turnover time along with advice on looking after the new paint-job! The highest levels of craftsmanship & care go into all our customisation procedures & all work is guaranteed (please see terms & conditions at bottom of page). Case studies & pictures can be viewed on our gallery page. Expect estimated turnover times of 6 to 8 weeks with certain paint types due to long drying times & between-coat preparation. 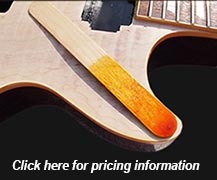 Guitar tops or backs will normally require complete re-spraying in the event of serious damage. Whenever possible please let us re-assemble the instrument after re-finishing, it can be a delicate process. Colour matching faded paintwork can be difficult & complete re-finishing is often an easier option. Re-finishing is a time consuming & costly process, always choose colours carefully & specify gloss, satin, matt etc. Nitro cellulose (Lacquer): This traditional coating as used famously by Fender & Gibson is less resilient to impact & requires more coats during application. Many vintage instruments were sprayed using this car-paint derived lacquer & today plenty of production guitars are still painted with nitro. Unlike modern polyurethane coatings nitro allows the wood to breathe, it also ages naturally chips-dinks & all (as per vintage guitars) & does not take away from an instruments natural resonance (unlike poly-finish). We still paint guitars using nitro & can offer most current & vintage colours. Polyurethane: Unlike traditional lacquers, poly-finish (as its often called) requires few coats due to its thick consistency. This modern (plastic-like) coating is today used on numerous modern production electric guitars & along with super durability, it has a few other benefits including resistance to fading & aging, faster drying times & safer application. Polyurethane is becoming more popular nowadays & we coat lots of instruments using this hard-wearing finish. We can also offer Acrylic type finishes which are hard wearing & durable. Stains, oils & natural finishes: We offer various staining & natural options for instruments in a wide variety of colours, with or without clear top coats. Oil type finishes are easily maintained once applied & many players prefer the playability of an oiled neck due to its non-sticky feel as opposed to conventional lacquer. Tung oil or Tru-oil are very popular due to their protective qualities & can really bring out the grain In certain tone woods. Application effects & styles: Re-finishing options include various 2 or 3 colour sunbursts, vast selection of solid colours in gloss, matt or satin, metal-flake, metallic/pearlescent, translucent & clear tint colours, classic vintage colours & natural finish staining. If you have a particular colour in mind, please ask as we can probably help! At Guitarlodge we offer a full restoration service for fretted instruments. This often combines many of the procedures included on this site, & quite frequently some additional investigation & Internet research! 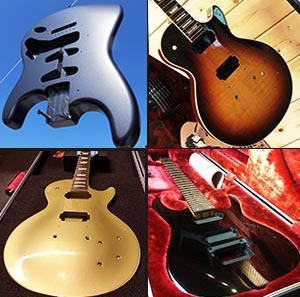 Restoring an instrument to its original or similar state can be involved & certain problems can arise, in particular when finding original replacement parts or finish colours. On vintage instruments components can be hard to come by & we often repair various parts in order to maintain authenticity & sale-able value. We have restored many fretted instruments from vintage Fenders & Gibsons to Mandolins & Banjos! We can advise on any restoration project that you may be considering & in certain circumstances offer a no-obligation guide quote (estimate). Please note long turnover times are to be expected with restoration work. This 70s Precision custom bass (pictured) was carefully restored at our repair centre. The neck was twisted & required straightening using heat treatment, this had possibly been caused by bad storage & lack of use. The body had been hand painted with household varnish years ago, this was removed & a few dents & gouges were carefully steamed out. The body was then prepared & re-finished in a natural satin 2K Acrylic clear coat. Some of the electrics were corroded & the control pots were replaced. All soldering was checked for dry joints, re-soldered & rewired where necessary. The original bone nut had broken so a replacement was fabricated from a bone blank. The bass was customised in the 70s & had a slightly wider nut seat than a standard USA Fender Precision. The bridge & hardware were all intact & luckily no replacement parts were required. The bridge was dismantled, cleaned & serviced. All other parts & hardware were cleaned & polished to their original state. After assembly & restringing using flat-wounds, the top register required fret dressing due to several dead spots that were causing string rattle. Once the offending frets had been dressed it was re-assembled, set-up, cleaned & tested. Approximate turnover time 6 weeks, cost £456. Personal inlay designs can be drawn & sent via email or post, please specify a preferred material. Complex designs can be difficult to accurately reproduce & may require changes; in this instance we will notify you & explain any changes before the work starts. When enquiring about names or initials, please specify the exact size & font type used in any designs. The inlay procedure pictured above shows dots being replaced with solid mother of pearl blocks, this is a commonly requested customisation. The customer in this case had inlays replaced on 2 guitars, the other had split blocks fitted. Our work policy: We guarantee to carry out the correct procedures required to repair your instrument. Should we notice any other work that we feel may need attending to, we will discuss this with you & only proceed if requested to do so. Your guarantee: We always guarantee our workmanship on re-finishing, inlay, customisation & restoration work for a period of 6 months, this only applies to the work we have carried out & parts used (if applicable). Paintwork & coatings are guaranteed against discolouration or reaction, but not scratching or assembly damage. String breakages or damage due to misuse or rough handling are not covered. Turnover times: Time-scales can vary depending on curing times between finish types & the number of coats the instrument may require. Restorations can be delayed pending any finish work, availability of replacement parts (if required) & additional set-up work, which may be necessary. Inlays require varying degrees of fretwork & time consuming cutting procedures, time-scales can vary, but allow at least two weeks. We will contact you if we are unable to meet an agreed turnover time. Payment: All bills will be settled upon completion of work to your satisfaction. Payment will be required upon collection of your instrument(s). We will only dispatch your instrument(s) once payment has cleared (courier service only). Details of payment methods can be found on our prices page.